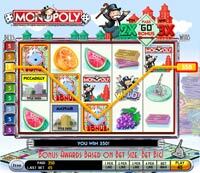 On the surface this online Monopoly may look like any regular themed 5 reel slot but this is far from the case. This slot is packed with features and bonuses which combines the the excitement of US multi line slots with the fun of a UK fruit machine. Once you access the bonus feature board, you always leave with something, even the 'go to jail' spot is a bonus feature. The graphics and sounds have been very cleverly put together to create a real buzz and atmosphere which is often lacking when you gamble online. Quite simply Monopoly sets a new standard for online slots and we would recommend you try the freeplay version to see for yourself. Spin in 3 Instant Bonus symbols in view on the last 3 reels and earn the Community Chest Instant Bonus. Click one of the animating Instant Bonus symbols to reveal your Bonus Multiplier. Your Instant Bonus award is calculated by multiplying your total bet times the multiplier value that you revealed. Earn the Pass GO Bonus by getting 3 Bonus Dice symbols on a payline on which you have wagered. When the Pass GO Bonus is triggered, select one of the 3 animating Bonus Dice symbols to determine how many dice rolls you get during the bonus round. Each Bonus Dice symbol reveals a different number of dice rolls, ranging from 1 to 6. After the number of rolls is revealed, you go to the Monopoly Bonus board, where you roll the dice to collect bonus winnings. 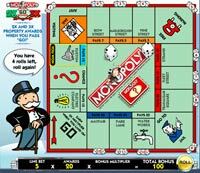 Once you arrive at the Monopoly Bonus board, click ROLL to roll the dice. Your game piece will move along the Monopoly board in a clockwise direction according to the sum of your dice roll. The small numbered dice symbols that appear on the spots indicate what dice value is needed to reach that spot. For your first roll in the bonus, your game piece starts off the board, so your first step is onto the GO spot. You start the bonus baord with an award of 10. Each time your game piece lands on a deed, you add the award value associated with the deed to your award. When you round the board and pass GO, the deed awards on the board grow. The first time you pass GO the deed awards are doubled. After passing GO twice or more, the deed awards are tripled. If your game piece lands on Chance, your game piece will advance to another spot on the board, selected completely at random. If your game piece stops on the Free Parking spot, you will be randomly given a award value. In addition to the awards that you accumulate, there are two special spots, GO and Jail, that can earn you even more cash! If you land on GO, you earn a 2x Bonus Multiplier, which multiplies your entire bonus total. If you land in Jail, you are taken to the Jail Bonus, where you can (surprisingly) earn a Bonus Multiplier if you roll doubles within 3 tries. The sooner you roll doubles, (both die values the same), the larger your Bonus Multiplier. If you roll doubles on the first roll you earn a 5x multiplier, if you roll doubles on the second roll you earn a 3x multiplier, and if you roll doubles on your last roll you earn a 2x multiplier. If you do not roll doubles within 3 tries, the Jail Bonus ends without adding a Bonus Multiplier. If you land on either GO or Jail more than once and earn a bonus, your Bonus Multipliers are added together. Add the end of your bonus round, your Total Bonus Award is calculated by multiplying the bet on the payline that triggered the bonus, times the sum of all of the awards that you accumulated, times the total of any Bonus Multipliers you earned.